Massachusetts Beaches: Public or Private? Who owns Massachusetts' beaches? The public or the individual property owner? That's a question that has vexed visitors and locals alike for a long, long time. It's also a question that you should know the answer to, before you stick your umbrella in the sand for a day of relaxation on our Massachusetts shore! In most US coastal states, the government owns the waterways and beaches, up to the high tide line. But not here in Massachusetts. No, siree. We're different! Nearly 300 years ago, when Massachusetts was still a colony of the British Empire, the Colonial government controlled our tidal waterways and all the land up to the high tide line. But our founding fathers (smart guys that they were!) realized that our Massachusetts coastline was an important part of commerce for the young Colony and its citizens. For goods to freely come and go by ship, we needed wharfs - and lots of them. What better way to encourage coastal landowners to build wharfs than to grant them ownership of the tidelands?! 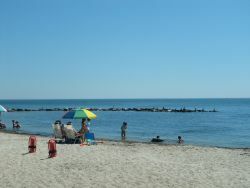 Virtually all publicly owned Massachusetts beaches are open to everyone, residents and visitors alike. A few are open to residents only. Most notably Lucy Vincent Beach and Squibnocket Beach in the town of Chilmark on Martha's Vineyard, and the town beaches in Mashpee on Cape Cod. But they're the rare exception to the rule. The vast majority of public beaches on Cape Cod, the Islands, and the entire Massachusetts coast, welcome all of us. Every now and then I'll hear a visitor say, "Oh, we can't go to that beach. It's "Residents Only". Well, that's not necessarily true. As I said above, I only know of a few Massachusetts public beaches where access is restricted to residents only. 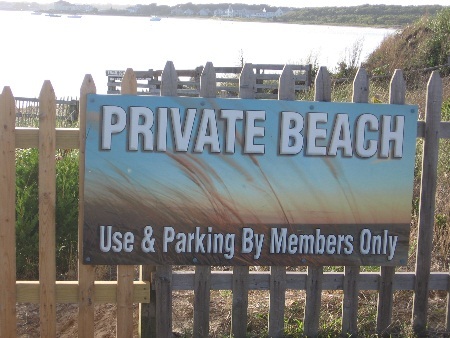 Usually what's confusing is the concept of a public beach where vehicle parking is restricted to residents only. As quirks of fate would have it, many of the most glorious town-owned Massachusetts beaches have very limited room for parking. So the individual towns may (and many do) restrict parking in their smaller beach lots to residents of the town. What does that mean for non-residents? May you still use the beach? Sure! You'll just have to get there under your own foot or pedal power. As the Colonial Ordinance sayeth: No trespassing on private property! If the beach belongs to an individual homeowner, then you must have the homeowner's permission before you plunk yourself down on the sand. If it's part of a hotel, motel or inn's property, then you'll need to be a registered guest to have access to the beach. 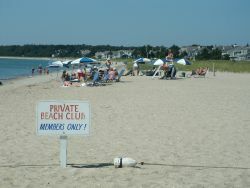 And if the beach is owned by an association or club, then it's reserved for use by members and their invited guests only. "Hey, You - Get Off My Beach!" How strictly are these rules enforced? Well, that depends on the owner. Most private beach owners I know here on Cape Cod are perfectly okay with people walking across their beach to get from one place to another. Although, you might want to stay off the one in this photo to the left. 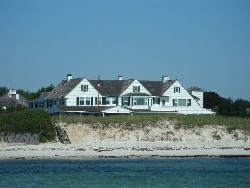 It's part of the Kennedy family's private beach in Hyannis Port. The practical reality is that people unknowingly wander onto private beaches all the time - especially on the north side of the Cape, on Cape Cod Bay, where you can walk for miles along the shoreline. Do the owners give you a hard time for walking on their sand? I've never seen it happen. The real annoyance normally comes when folks stroll onto a privately owned beach, begin using it as though they own it, and then get mouthy when they're asked to leave. If you're thinking, "What's the harm, if we're just sitting there?" ... please take a moment to consider it from the owner's point of view. How would you feel if total strangers came into your backyard, sat at your picnic table, and took a snooze on your lawn - without asking you if it was okay? If you really have your heart set on having your own little slice of sandy paradise all to yourself, consider renting a house or cottage with its own private beach!